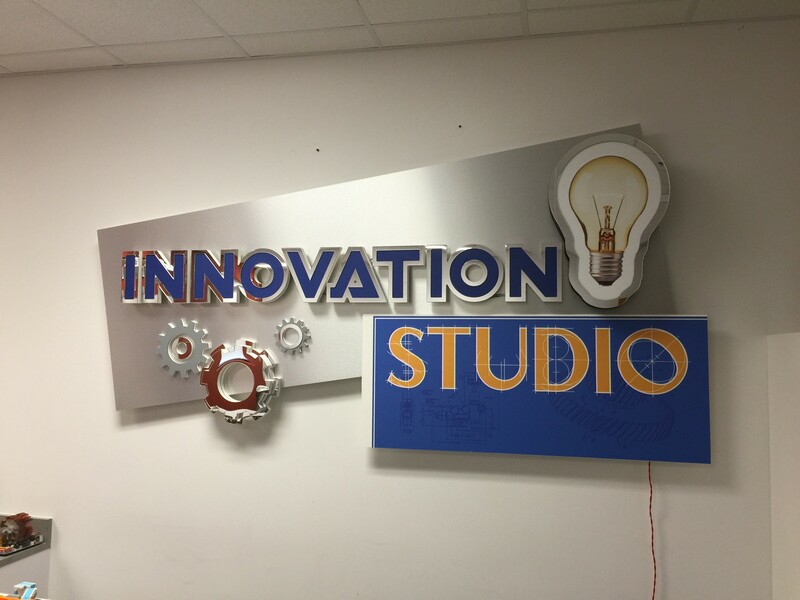 This was a fun project for Lakeview Academy’s Robotics’ Team Lab – the Innovation Studio. We used a combination of brushed aluminum, mirrored acrylic and PVC to create the backboard and illuminated it with back-lit LED letters. There is a high resolution digital print (laminated to prevent fingerprints) with a blueprint-style design and the work STUDIO in an architectural font. The lettering is stud-mounted to the backboard, the the backs of each letter are hollowed out on our CNC router table. 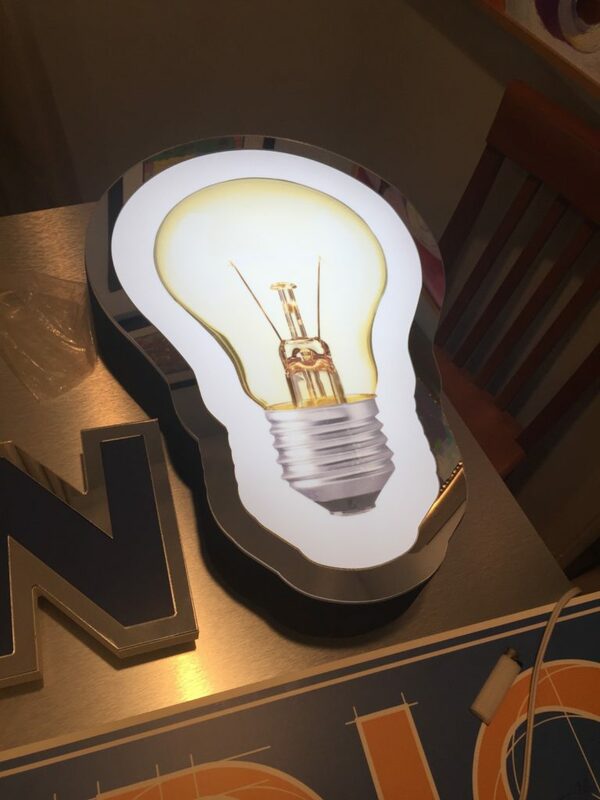 This allowed up to insert red led lights in the letters, and white LED lights inside the lightbulb. 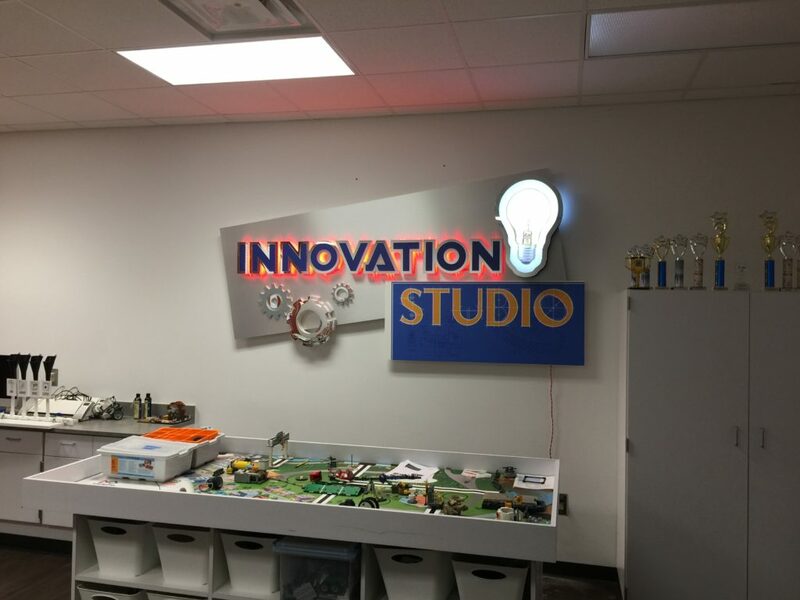 Rather than making the lightbulb as an internally illuminated sign “can” we made the side walls in HDU and brought the electrical through the back to one common power supply. The teachers were concerned about students playing with display, and turning it on and off frequently. We build a James Bond style switch concealed on the side that only the teacher know about, and installed it high enough on the wall only the teachers can reach it. We used a retro-style dual spinning cord for the electrical service. As you can see, it turned out fantastic! The red LED’s on the brushed aluminum almost look like a molten metal effect! 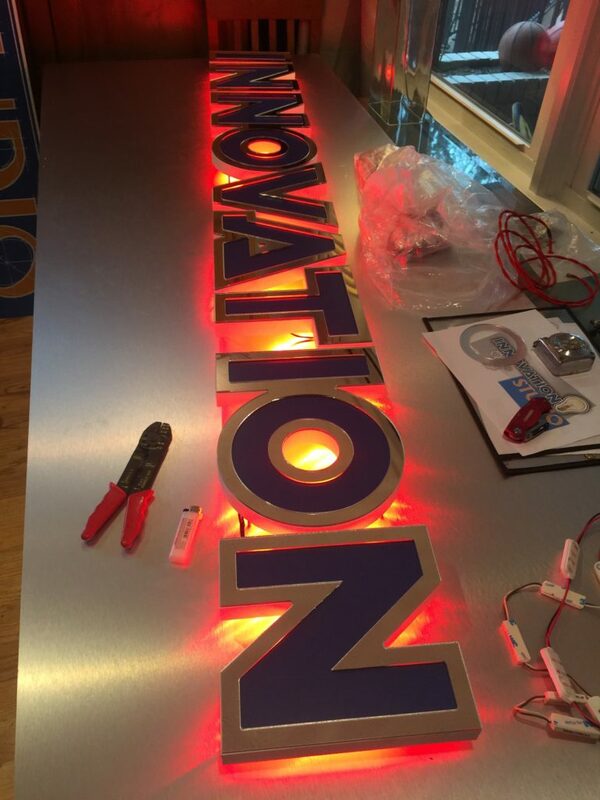 Our custom back-lit LED letters on wall logo displays are the perfect solution when you want the “wow” factor. With over (2) decades of nationwide success, we will make You Look Your Best! We welcome any challenge, and can produce anything you can imagine! Please use our online contact form to start your next sign project. This entry was posted in Business Signs, Commercial Signs, Completed Sign Projects, LED Sign Projects by BSM Staff. Bookmark the permalink.